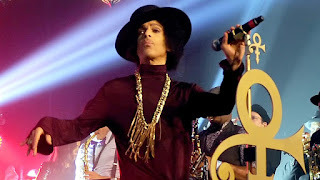 Prince was on the last day of his Act II tour of Europe when he appeared on BBC Radio 1 for a 'secret' show in the Broadcasting House Concert Hall. His 20 minute performance was part of that morning's Simon Bates show. The concert itself has been repeated on 6 Music and copies can be found online. When Prince unexpectedly died in April I didn't realise I had my own recording of the one-off concert. However, I chanced upon the tape the other day when I was rummaging for some other archive material. As well as Prince's performance the tape contains the rest of Simon's show between 11.30 and 12.30; the concert started around noon. So here for the first time in 23 years, since it aired on 7 September 1993, is Prince's energetic live set in context complete with a pleased-as-punch Simon Bates. A quick confession: my C90 did its tape turn bang in the middle of the set so I've spliced in that particular song from another source. Footnote: the tape I was looking for, somewhat incongruously, was for a Victor Silvester programme, which I didn't, as it turned out, possess anyway.